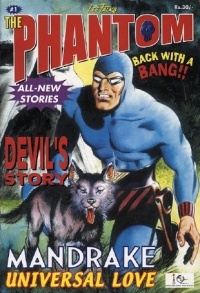 The Phantom was a Phantom comic book published in India. The series was published by Egmont Imagination (India) Ltd. (formerly Indian Express Egmont Publications Ltd. and Egmont India). The material came from the Team Fantomen production of Phantom stories. Fantomen editor Ulf Granberg assisted in the selection of stories. All issues up to #13 had a "Mandrake the Magician" back-up story, were 52 pages in color and with covers from Fantomen. After the first issue there was produced a promotional package called Phantom Adventure Kit, that included three comic books (two of which could not be bought elsewhere) and memorabilia. In February 2003, the entire series was relaunched with at least 20 (21 ?) issues published more or less simultaneously. Most issues, but not all, featured stories that had already been published in the first series, but with new cover art and new issue numbering. None issues with Mandrake.